The surprises at Dodger Stages start at street level. 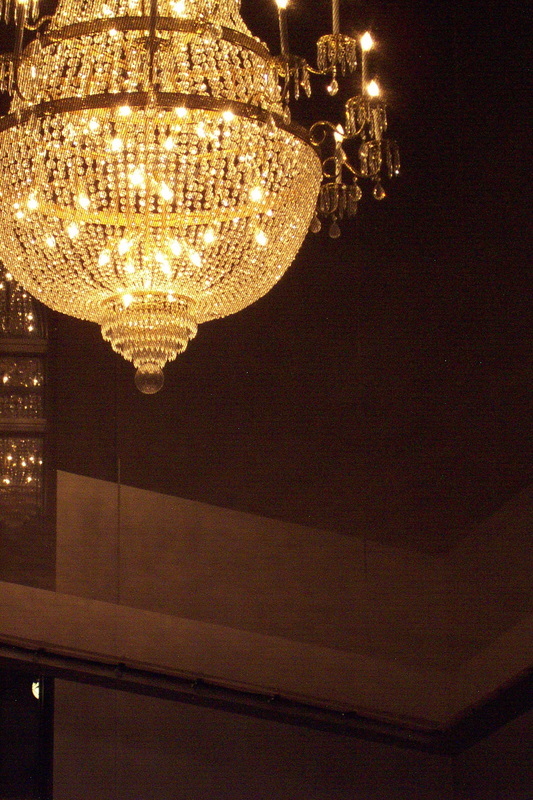 Through the windows on 50th Street, passersby now glimpse a crystal chandelier, the sort of fixture that might be expected to hang from the dome of a venerable Broadway theater, but not in the small, low-ceilinged foyer of a 1980s building. 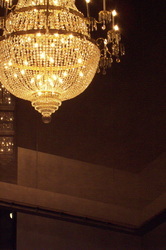 Upon entering the foyer, patrons will see that the floor drops away, and that the chandelier is actually hanging over the escalator and staircase that lead down to the theaters. Adding to the effect, the designers have created an ever-moving interior “sky” by projecting images onto a canted scrim of metal mesh, suspended over the entire entrance space. Upon descending past banks of theatrical lights to the mezzanine level, patrons discover the first suggestion of an indoor street. 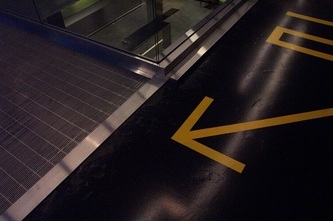 Wayfinding devices—words, numbers, directional arrows and even lane markers—are painted onto the floor, in imitation of roadway signs. 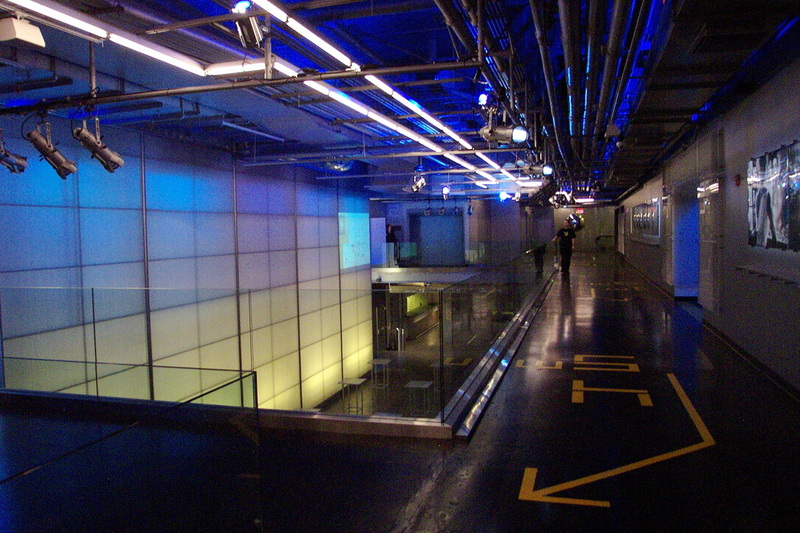 The area around the escalator and stair landing is also the setting for a large bar, open to both theatergoers and the general public, where visitors will first notice the contrast in Dodger Stages between the new high-gloss finishes (such as plexiglass and stainless steel) and older, exposed textures. 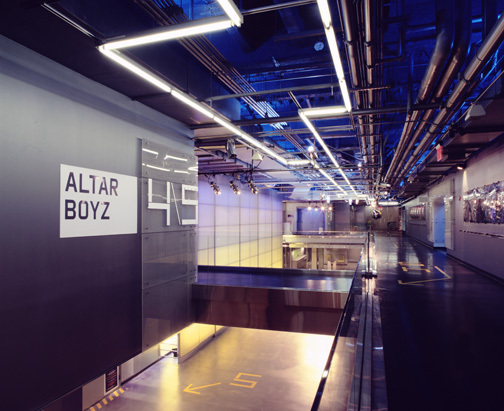 In the spirit of off-Broadway theater, which has long flourished by reinventing existing space, the designers have laid bare some surfaces, such as a rough concrete wall, and have showcased others—for example, by building lightboxes around structural columns. 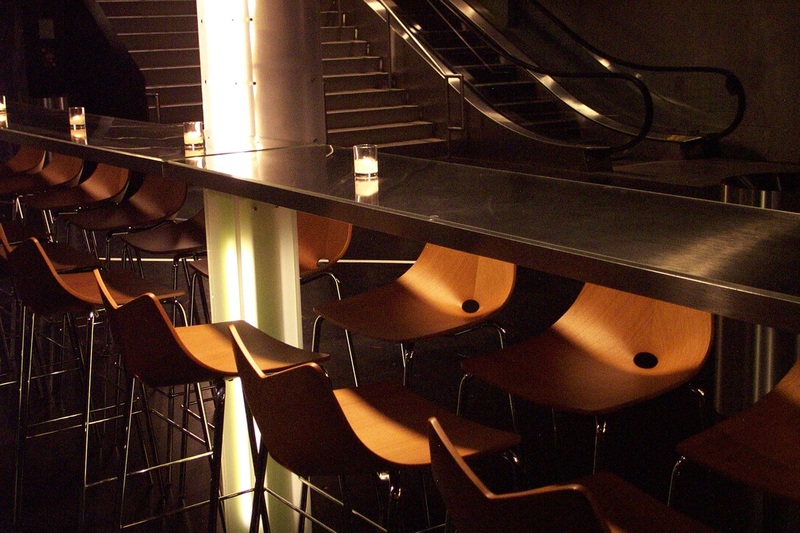 The single largest architectural move becomes evident when visitors go beyond the bar and into the mezzanine lobby. When the building was a cinema multiplex, the public never circulated on this level; the mezzanine was exclusively back-of-house space, used by the film projectionists. 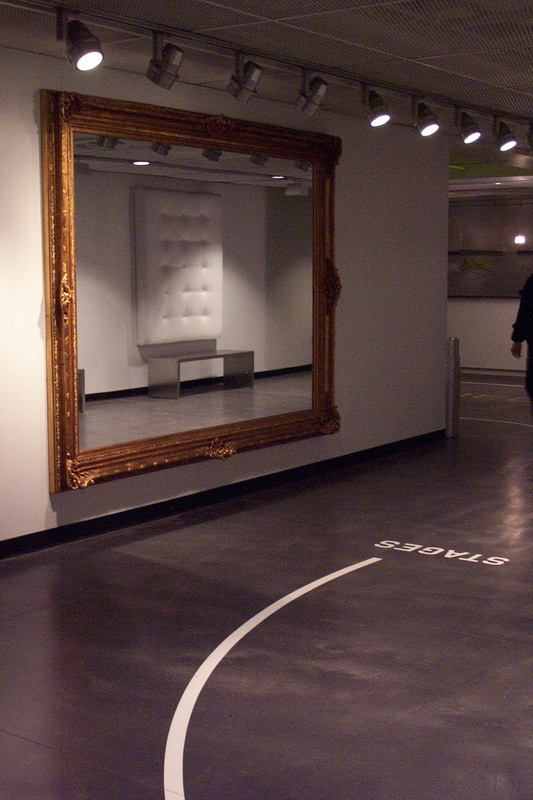 The Design Team has now moved back a wall to open this space, carving out an ample, double-height lobby. Patrons on the mezzanine may enter the balconies of the two larger theaters by passing down a walkway, which runs the length of the lobby’s east side. To enter the smaller theaters, patrons may cross west over the lobby on either of two bridges. 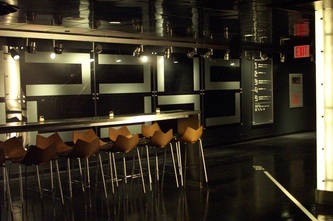 Patrons may also enter the theaters at the building’s bottom level, where the effect of the lobby is at its most dramatic. 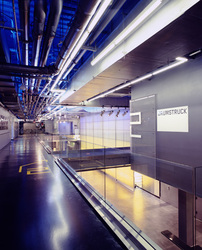 A wall of light occupies most of the west side of the space, rising to its full double height. Light projections play across the metal-mesh scrim that covers the wall, creating an effect similar to the interior “sky” of the foyer. 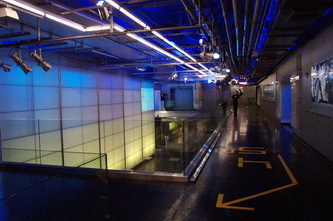 The light wall also serves as a cue for audiences. Large numerals—one for each of the five theaters—light up behind the scrim to tell patrons that the show is about to begin. 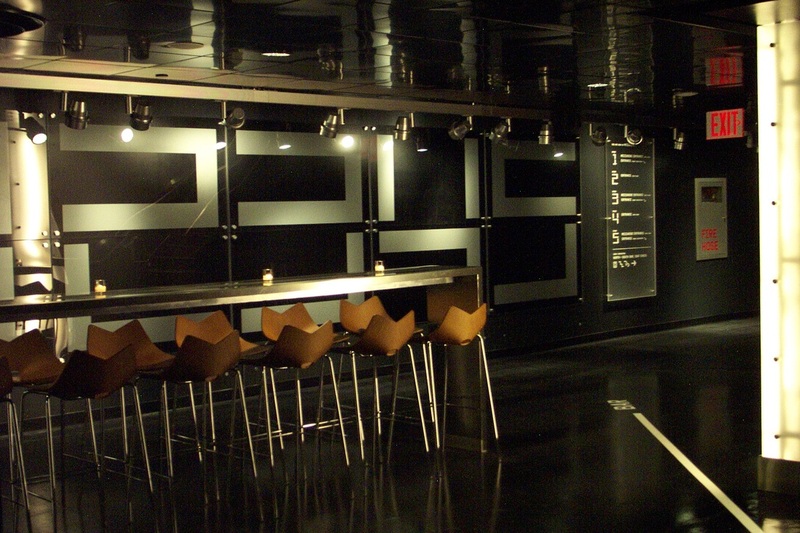 The lobby is the place for another major contrast between elegant and rough finishes. A custom-designed fluorescent light fixture runs in a linear pattern over the lobby, reinforcing the geometry. 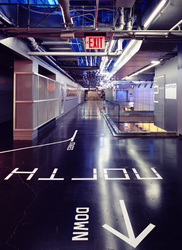 Above this sleek element are exposed ducts and pipes, as complex and industrial-looking as the fittings of a submarine. Between these two layers of the ceiling are programmable colored lights, which vary both the mood and the apparent dimensions of the space. Treating the floor level of the lobby as a theatrical set, the designers have incorporated furnishings from a scene shop: an antique sofa, a rococo mirror. Near the coat checkroom (a rare amenity in New York theaters) stands a dress form dummy. Bringing the theme of the indoor street to its culmination, the front ends of motorcycles are parked at various places at the lobby’s far end. The interiors of the five performance spaces themselves have been deliberately designed to be visually simple and undistracting. These spaces are also designed to be highly flexible for producers, convenient for performers, and comfortable for theatergoers. The result of this design collaboration is an elegant, intimate and unique theater space, which stands to provide New York City off-Broadway productions with an exciting new venue.